Mysterious creature originally found on planet SR388 for which is thought to also be its native planet. Also thought to be parasitic. An airborne life form totally capable of flight through it's almost weightlessness. The Fission Metroid is not actually a Metroid at all, but a genetically identical clone created thru phazal manipulations of the Metroid Prime. 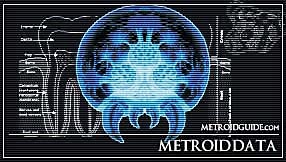 Galactic Federation xenologists speculate that at some time or another during the early stages of the Space Pirates operation on Tallon IV, escaped Tallon Metroids came in direct contact with the Metroid Prime. It was during this contact that the judgement of the Metroid Prime deemed them formidable local predators, and began to manifest them inside it's lair as a means of protection. The specifics of their exact creation is unknown, but is believed to use the biomutative properties of Phazon itself to fissure into their observed forms. 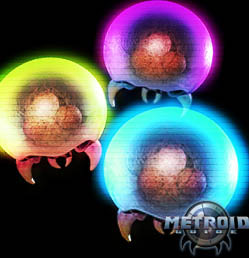 This creation by the Metroid Prime also endowed them with it's invulnerablities to particular elemental types. As observed, unique variants based off of electro-wave, charged energy, and even cold (unique from all other Metroid strains) have been noted. Each is differentiated by an etheral color shift in their outer carapaces. Their behavior is somewhat of an oddity. At first glance, their behavior seems to be dirivved off of Tallon Metroid populations; seeking of prey and basic dominant behaviors. Through closer inspection xenologists have noted due to the rapid breakdown of their DNA structures credited to Phazon, they are highly weary of movement. This hightened awareness is believed to be caused by a breaking down of the frontal optical sensors in the fore nuclei. This in turn disrupts normal discerning of objects, causing them to literally jump at anything that moves. Also a unique aspect is their ability to use any energy that is excess to fissuaize into an exact replica of themselves. Through minor variations in the genome, this causes the fissual clone to adopt a different enviornmental vulnerability. Beyond fissual replication, it is believed with each division the DNA structure degrades by 34%, causing a much shorter lifespan for the replicated Metroid. This too is due to the high amounts of Phazon which eventually poisons the organism.